“CONVERSATION HEARTS” is a Daily Devotional meant to keep us focused on the words we speak daily. Acceptable words are pleasing to the receiver; they are welcomed words. 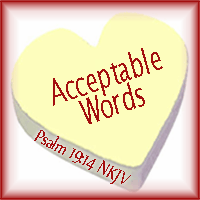 Today let’s try our best to use words that are Acceptable to God, which would be words that please Him. Let our speech be All for Him Today! Dear God, I want to honor You with the words I speak today. As my heart is full of love for You, may also my mouth speak that love to the world around me. May my day today, be All About You in everything I think,say and do, and may my words be Acceptable to You!